In the late 1990s the US military committed itself to pursuing Network-Centric Warfare and Full-Spectrum Dominance, which eventually led to the largest military R&D contract in history--the Future Combat Systems program. Several years, two wars, and many billions of dollars later, those digital technologies are finding their way onto the battlefields of Iraq, Afghanistan, and the Global War on Terror. This course focuses on exploring the technologies and media that are having the greatest impact on the way war will be fought in the near future, as well as the cultural meanings of warfare, and the propensity to war itself. We explore how these technologies are changing the nature of warfare, and the rhetoric that is used to justify the development and use of these technologies. The course critically examines the claims that technologies can produce increasingly risk-free, or even bloodless, wars, and considers how the risks of engaging in armed conflict are being redistributed. 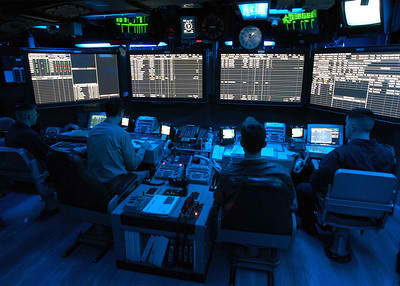 Topics discussed include the military's use of video games for recruitment and training, the use of video game interfaces for real-world technologies, the use of database systems to manage vast quantities of information in warfare, and the increasing use of military robotics including armed Predator and Reaper drones. This course examines the complex relationship between digital technologies and warfare, from both the perspective of how wars are conducted, and how they are represented in media. Each week we will have students prepare comments and initate discussion on selected reading assignments. Each student is required to do 2 such presentations over the course of the semester. There will usually be 2 each week, and we will seek volunteers for selected reading the preceeding week. The goal of the presentation is to provide a short high-level summary of the main argument of the reading, followed by a critical assessment of it, and the initiation of class discussion. Students will be required to make weekly blog entries commenting on the readings for the week. You will be required to create an account on WordPress, and send me an email with their LoginID and the EMAIL ADDRESS used to create the account, so that you can be added as authors for the collective course blog. Everyone will be posting to a common blog page, and this will be readable by your classmates. When writing and making comments, you are expected to treat other students with the same respect and courtesy as you should in the classroom. There will be no final exam. Instead, a final research project will be required. For most students, this will take the form of a 3000-5000 word (Times New Roman, 12pt font, double spaced) term paper, due shortly after the last day of class. If that deadline will not work for you, you need to make other arrangements one week in advance, at the latest. Films and media projects can also be used to fulfill this requirement, but must be approved and should approximate a similar amount of research and work. Project topics can address any aspect of the topics and materials discussed in class. Projects should include materials beyond what is directly covered in class, as appropriate for your topic. In other words, they should require research. The blog will provide many ideas for projects, as will class discussion. You will have to write a proposal for your project by the deadline, but you should be thinking about possible topics from the start of the semester. Research proposals should state the question, problem, or phenomenon that will be the focus of your research. It should also state your thesis or position on the issue, as well as outline the argument you will use to support your position. This applies to both papers and media projects. You should also indicate the sources and materials you will consult and utilize in making your argument. For media projects, you should state as clearly as possible what you intend to deliver for the final draft (i.e., video length, style, format, content, etc.). The first draft of your project is due in November. Like all drafts, this should be treated as if it could be the final draft.It should be a complete term paper or media project. The argument should be fully developed, with appropriate citations, and draw upon your research. You will receive feedback on this proposal to further develop your research into the final project. Since even the best papers can be expanded and improved, you will get a chance to do this, based on my feedback, for the final. Re-writing, re-editing, and revising are important and necessary skills for improving your work, so we will focus on this when turning the first draft into a final draft. Ideally, some papers might be suitable for submitting to journals for publication by the end. Papers and written proposals should be submitted to me in electronic form (Word Perfect, MS Word, PDF, HTML and plain TXT are all fine). Late final papers will not be accepted, as I must turn in grades shortly thereafter. Instead of pursuing an individual research project, you have the option of pursuing a group research project. For the students pursuing this option, the process will be much the same, with the Proposal being an individual statement of what you plan to contribute to the group project, and the Draft and Final projects being collective efforts to realize the research project. In addition, each person choosing this option must submit a 1-page self-assessment of their participation in the group, due at the same time as the Final project. For the Group Project Option, the topic will be to develop a media stragtegy and/or social media strategy for the International Committee for Robot Arms Control (www.icrac.net). As a co-founder of this organization, I will provide guidance to the group. However, it is largely up to the group to conceive and develop the project. The actual project could range from a high-level media strategy, to a website re-design, to a social media campaign, to an audio/video or digital media project, or any combination of these or other ideas. 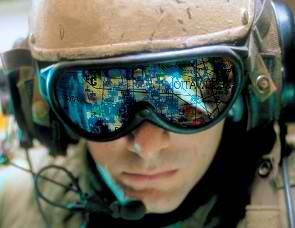 Watch: DocZone, (2011) Remote Control War, CBC, 45 min. Tim Lenoir (2000) "All but War Is Simulation: The Military-Entertainment Complex," Configurations, Volume 8, Number 3, Fall 2000, pp. 289-335. Brian Burridge (2003) "UAVs and the Dawn of Post-Modern Warfare: A Perspective on Recent Operations," RUSI Journal 148, no. 5 (Oct 2003): p. 18-23. Alexander R. Galloway, (2004) "Social Realism in Gaming," Game Studies: The International Journal of Computer Game Research, Vol. 4, No. 1. Tim Lenoir (2003) "Programming Theaters Of War: Gamemakers as Soldiers," in Robert Latham (ed.) Bombs and Bandwidth, New York: The New Press. Kurt Squire (2002) "Cultural Framing of Computer/Video Games," Game Studies: The International Journal of Computer Game Research, Vol. 2, No. 1. Craig A. Anderson (2003) "Violent Video Games: Myths, Facts, and Unanswered Questions,"American Psychological Association Science Briefs. Dave Mosher (2011) "Defeated Videogame-Violence Experts: Science Was on Our Side,"Wired Science, June 28, 2011. Watch: (2011) Game Deaths, YouTube, 3 min. Watch: (2006) Croyt's Anger, YouTube, 5 min. Listen: Radiolab (2011) Games, WNYC, 78 min. Dave Grossman and Gloria DeGaetano (1999) Stop Teaching Our Kids to Kill, New York, NY: Crown Publishers, pp. 1-122. Nicholas L. Carnagey, Craig A. Anderson , and Brad J. Bushman (2006) "The effect of video game violence on physiological desensitization to real-life violence ,"Journal of Experimental Social Psychology, Volume 43, Issue 3, May 2007, pp. 489-496. Dave Grossman (1995) On Killing, New York, NY: Back Bay Books, pp 1-94. Brian Todd and Dugald McConnell (2011) "Autopilots may dull skills of pilots, committee says," CNN, September 1, 2011. Cuihua Shen, Hua Wang and Ute Ritterfeld, "Serious Games and Seriously Fun Games: Can They Be One and the Same?" from: Ute Ritterfeld, Michael J. Cody, and Peter Vorderer (eds.) (2009) Serious Games: Mechanisms and Effects, Routledge, pp. 48-61. M. Ephimia Morphew, Jay R. Shively, and Daniel Casey (2004), "Helmet Mounted Displays for Unmanned Aerial Vehicle Control," in Helmet- and Head-Mounted Displays IX: Technologies and Applications. Edited by Rash, Clarence E.; Reese, Colin E. Proceedings of the SPIE, Volume 5442, pp. 93-103 (2004). Tim Lenoir (2002) "Fashioning the Military Entertainment Complex," Correspondence: An International Review of Culture and Society, Vol. 10, Winter/Spring, 2002-2003, pp. 14-16. Brian Burridge (2005) "Post-Modern Warfighting with Unmanned Vehicle Systems: Esoteric Chimera or Essential Capability? "RUSI Journal 150, no. 5 (Oct 2005): p. 20-23. Work on Final Project Proposals! Watch: John Pilger (2010) The War You Don't See, BBC, 120 min. Paul Edwards (1996)The Closed World: Computers and the Politics of Discourse in Cold War America, Cambridge, MA: MIT Press, pp. 1-145. Watch: Frontline (2000) The Future of War, PBS,6 min. Severo Ornstein (1987) "Computers in Battle: A Human Overview," in Computers in Battle: Will They Work? New York, NY: Harcourt Brace Jovanovich, pp. 1-43. David Alberts, John Garstka, and Frederick Stein (1999) Network Centric Warfare: Developing and Leveraging Information Superiority, Second Edition, US Department of Defense: CCRP. Watch: Stanley Kubrick (1964) Dr. Strangelove or: How I Learned to Stop Worrying and Love the Bomb,95 min. Asaro, P., and G. Dabringer (2010). "Military Robotics and Just War Theory," in Gerhard Dabringer (ed.) Ethica Themen: Ethical and Legal Aspects of Unmanned Systems, Interviews, Vienna, Austria: Austrian Ministry of Defence and Sports, pp. 103-119. Asaro, P. (Forthcoming 2012). “On Banning Autonomous Lethal Systems: Human Rights, Automation and the Dehumanizing of Lethal Decision-making,” Special Issue on New Technologies and Warfare, International Review of the Red Cross. Arkin, R.C. (2007). Governing Lethal Behavior: Embedding Ethics in a Hybrid Deliberative/Reactive Robot Architecture, Part I. Motivation & Philosophy,GVU Technical Report GIT-GVU-07-11, pp.1-8. Sparrow, R. (2007). "Killer Robots," Journal of Applied Philosophy, Vol. 24, No. 1, 62-77. Watch: Democracy Now! (2012) "Julian Assange on WikiLeaks,", Nov. 29, 2012, 55 min. Ellen Nakashima (2011) "Cyber-intruder sparks massive federal response — and debate over dealing with threats," Washington Post, December 8, 2011.